In most areas balconies are not used for their design purpose; rather then being opened to fresh air they`re closed with windows in most cases and worst, a big part of them are being used as storage or as an unnatural extension of the apartment or home. This blog post stands here to change all that. Green has been missing from the market lately. It’s a color that I love and will always use and I feel it’s making a comeback.
. It’s such an important color because it brings nature indoors and into the home and for this reason I love to decorate my home with plants. Plants bring natural beauty to our living spaces. By creating texture and balance, our patio can be transformed into an environment that comforts and welcomes. But, just like Miss Universe, plants can do more than look pretty. They’ve been proven to reduce stress so well that one glance at a plant lowers your heart rate. Plants simply make us feel better. 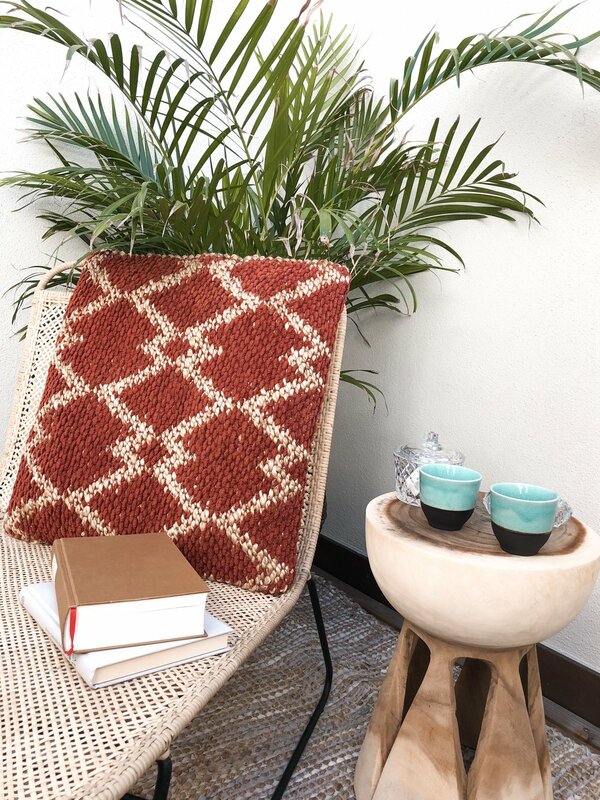 My Marrakech trip inspired me to decorate my balcony and for this reason I call it my peaceful little Riad. I bought everything at La Redoute and I can tell you they have the most beautiful furniture. in collaboration with La Redoute.